adding a "hidden" field - uses? Is it only when the form is submitted? For example: What would be best a way to add a "For Office Use Only" field, and then later the office would add a person's payment info and date received. If the person prints the form out and sends it in with their payment instead or in addition to submitting online ... then there is no applicable field. So, is it better to just include it under the SUBMIT button... so it's always available and visible? Let me explain what is the puropose of a hidden field : Ussually our custmers use a hidden field to assign a unique id to each submission, for example for tracking purposes. In your case, I think the most suitable solution is to setup a SHOW/HIDE conditional logic. 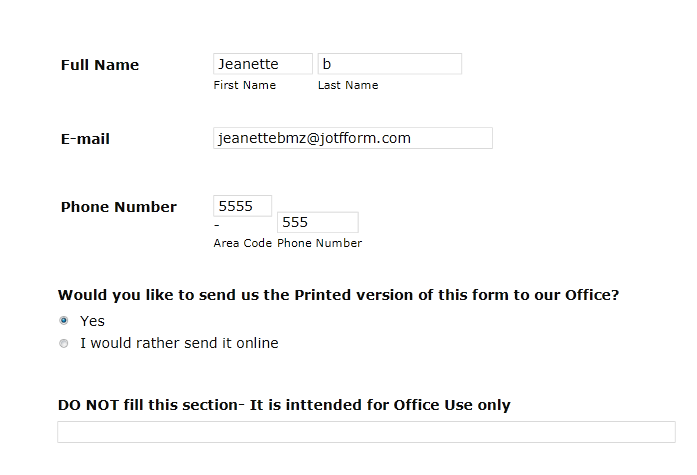 I have made a form sample, for you to see how it would work.